At circleindigo we are always on the watch out for new technology that we can use to support what we do. One way we do this is by using technology to produce simple graphics in our workshop design, on flip charts, in workbooks and on our website. So what Technology have we found? One app that we use for simple graphics is ‘Paper’ made by a company called 53. We use this to produce the simple graphics we use on our website (www.circleindigo.com) to help illustrate our facilitation ‘products’. We also used this technology to redesign a set of graphics embedded in to our facilitation skills training workbooks, including our new programme ‘Facilitation Skills for Trainers’. We create all the graphics using Paper and export them in to the WORD document that is the participant workbook. To digitally capture flip chart outputs with technology, we use ‘camscanner Pro HD’. This allows you to take photos of flip charts, clean them, reduce the file size and send a whole file of digitised outputs to your client. We use this on the iPad as it’s easier to manage on a bigger screen. An app that does the same as camscanner but has an added feature is ‘Inkflow Plus’ made by Qrayon. 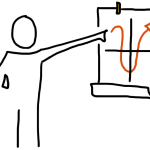 Additional functionality allows you to ‘cut’ parts of flip chart output and move it. So whilst it might have originally been on one part of the flip, you can cut and re-position it elsewhere, neat huh!? And one more app from Qrayon called ‘Stickyboard2’. This lets you to create different size and different colour digital post-its, move them around and draw arrows/connectors between them. You can then export your file either as text or as a PDF. All great facilitation technology tools to support your practice.